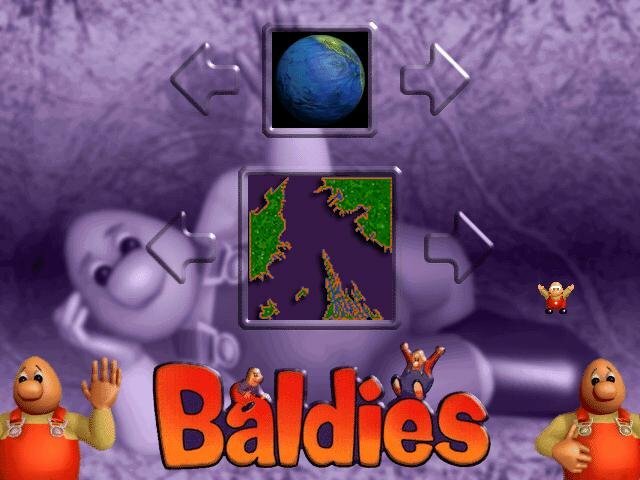 Delivered with a cartoonish flair, Baldies is a real-time strategy game of a different sort; you won’t find a heavy militaristic theme or science fiction-inspired plot, instead, the ultimate goal of these shiny-domed guys is to take out the Hairies, a sinister race of beings that have (ick) hair growing out of their heads. The baldies change clothing to fit the world they’re in (the buildings and inventions change too), and the animations that accompany their actions give these little guys a lot of personality — whether they’re jumping on the bed in the break room or relieving themselves on the side of buildings as they wander outside — you’ll probably find yourself chuckling at their antics at some point during a game. However, after playing for a while, that cuteness tends to wear off when the inevitable frustration rears its ugly head. 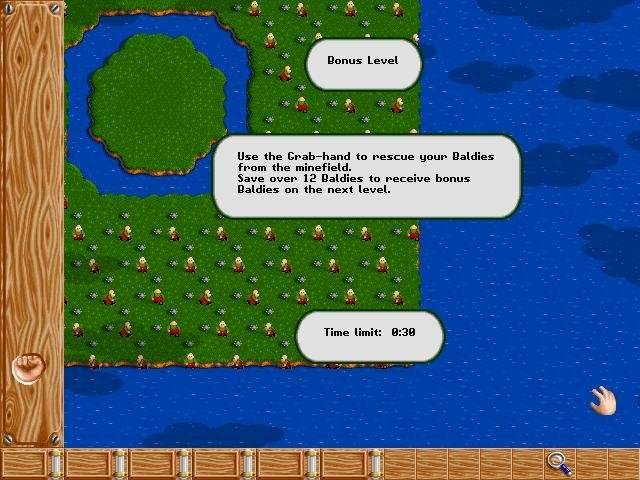 Instead of controlling groups or single units like in WarCraft II or Command & Conquer, the baldies simply wander around the field, intermingling with the enemy, and generally just walk randomly across the map. They pay no attention to where they’re going, even to the point of setting off the traps you’ve laid for the enemy. Here’s where the “strategy” comes in. You have to think about where to build traps to catch the enemy as they wander about, but far enough away so your baldies aren’t killed by mistake. You need to weigh the consequences of taking your workers out of the recreation/reproduction room and turning them into scientists to lay more traps. However, it’s a strategy based solely on luck, which no good strategist would ever want to trust in a battle situation. 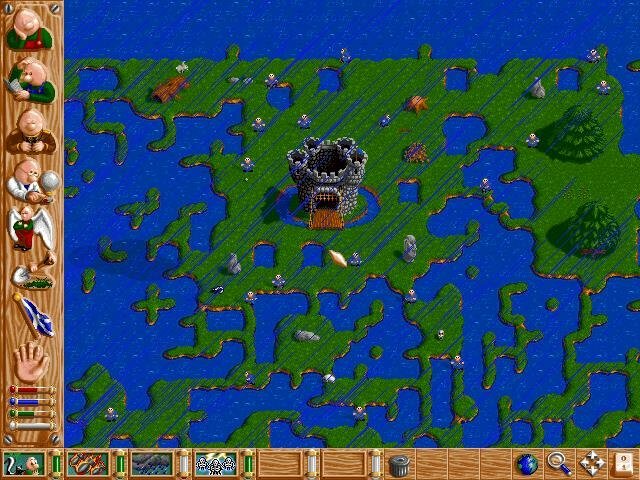 The game has a lot of variety, with several worlds and atmospheres to play in, and over 100 levels to try out. 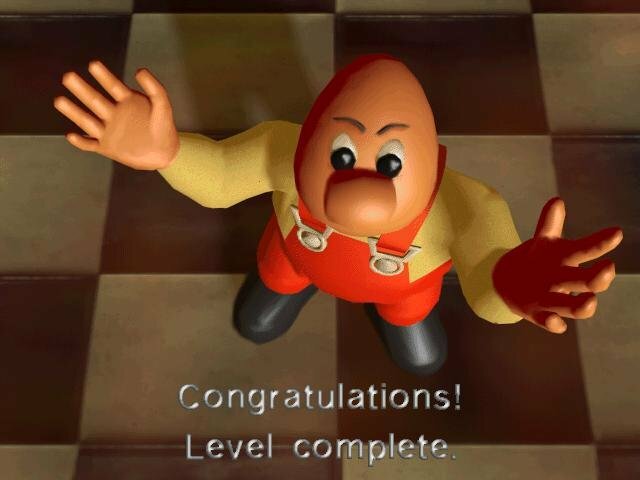 But the frustration level simply overwhelms the fun factor when you’re dealing with units that don’t do what you want them to do and an unclear understanding of how some of the game mechanics work, as both the manual and tutorial neglect to explain key features of gameplay. It is a really interesting game I must say. This was a big favourite to my brother and he always asked me to play “the cute game with bald guys”. I must say it is quite hard to understand what is going on, but this is a game for player who just learn to use the strategy like a reflex and not thinking it and micromanaging. I think it is actually genius because most games are about control-kind of leadership while this one shows it off how hard it is when you are not controlling servants but individually roaming “baldies”. I wonder if there are people who mastered the art of this – maybe except the developers – because if not, then it is just a failed attempt and a funny cute game. I kind of always thought it can be learned how to play it well, but to tell the truth we never managed to do so haha. There is some logic in this, but it is by no standards a “usual strategy game” style and it would be in its own niche gaming genre – if ever people would be able to make something like this that actually works more than it frustrates. You don;t happen to have part 2 of this game called skull caps do you?